Motorized Pulley diameter 800 mm - Length min. RL 950 mm and power between 22.0 and 132.0 kW. 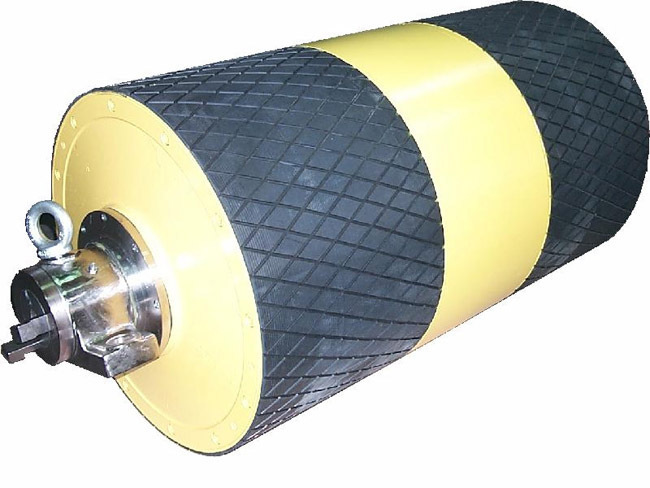 Meant for heavy duty applications with toughest, irregular & most extreme and brutal working conditions. Therefore, it is important to notice the differences to choose the right type of pulley for the right application based on estimated belt tension (radial load) = T1+T2. The actual radial load MUST be LESS than the max. allowable radial load shown in this catalogue. Be aware of increased belt tensions using multi-ply thick heavy belts and/or larger belt widths. Motor/gearbox of 800M has its origin from 630H. However, 800H remains top of the range as to design, reinforcement and strength. 800M, H and 800HD are designed for HEAVY DUTY applications and they provide the necessary torque, belt pull and allowable belt tension in order to handle the toughest, irregular & most extreme and brutal working conditions.